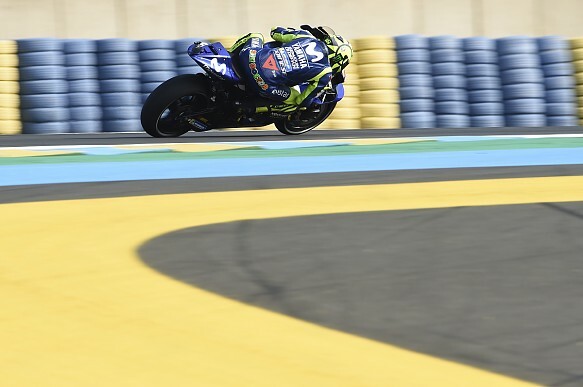 Yamaha MotoGP rider Valentino Rossi says his form in Friday practice at Le Mans allayed his fears after poor showings at Jerez and in private testing at Mugello. Rossi finished fifth last time out in the Spanish Grand Prix, but the result was aided by attrition and came on a weekend when the works Yamahas struggled badly for grip. The factory team then took part in a test at Mugello that Rossi says only added to his worries ahead of Le Mans, which has previously been a Yamaha stronghold. But after ending Friday third overall, a quarter of a second behind the pacesetting Ducati of Andrea Dovizioso, Rossi said Yamaha's performance was "more positive than what I expected". "In Jerez I know that we had to suffer but also at Mugello I was quite slow, so I was very worried about Le Mans," Rossi said. "But on this track our bike works very well, also this asphalt is very good, has a lot of grip, and also the low temperature - because here today was perfect, sun but it's not very hot, so it's the perfect condition for us. "We have a lot less problem also with used tyres. I have a good rhythm, that is very important for the race. "It's just Friday but like this is a lot more fun compared to Jerez." 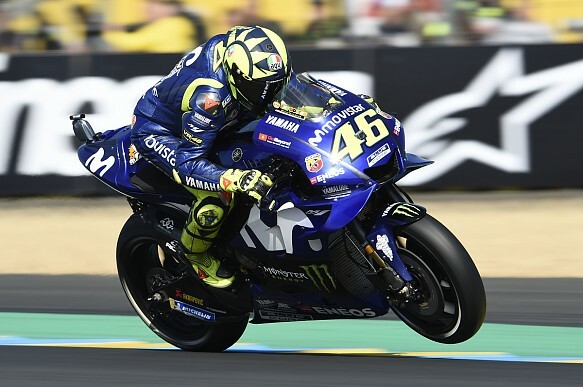 Rossi said it was not fully clear why Yamaha was so consistently fast at on what "on paper is not a Yamaha track", but reckoned the layout masked the bike's electronics weakness. "Difficult to say," he said. "You arrive from Jerez, where you have a lot of problems, and you put the same bike out here and it's OK.
"So it's the marriage between the bike, the tyre and the track that works. "On this track, historically, you [wheel]spin less because the corners are more short, and also because the asphalt has more grip. "When these two things are together, the electronics are less important, so we suffer less." Team-mate Maverick Vinales, who beat Rossi to Le Mans victory last year, ended the day just 0.025s behind the Italian. He said he was satisfied with how the bike was working, but admitted he was not feeling as confident as last year in France. "For sure I didn't have the confidence I had last year to push because last year I arrived here with really good rhythm, [from previous] races, so I arrived with maximum confidence with the bike," said Vinales. "The bike is working well, this morning I could keep up the race pace that I did last year. "In the afternoon I tried something different on the bike that I already didn't like how it was working and we wasted a lot of time in the box trying to change those things. "Overall I think we improve a little bit in Le Mans. Now we have to set the bike up a little bit better for the track."